Well it’s almost Oscar bait season and we’ve got a few upcoming films/actors looking poised to throw their hats into the ring. Fences, Silence, Hidden Figures, and The Comedian all look like they could have some stellar performances, and we’ve got some familiar entries given major overhauls for the times, with Beauty and the Beast and Kong: Skull Island. Check out everything we’ve rounded up below. Well, doesn’t look like Disney will be satisfied until they remake every one of their classics into a live-action feature. They’ve been a mixed affair so far. Jungle Book was pretty good, Alice in Wonderland had moments, but everything else has been pretty garbage. Beauty and the Beast looks like it’ll be somewhere in between. But please god, leave Lion King alone. While the movie doesn’t look like anything original, the story itself is something I, and probably most people, had no idea about. There’s so much buried history slowly coming to the light, and I think it’s good people are getting their just dues. I say let’s keep digging. It took me a minute to realize where I’ve seen this kids face before. He was the newest Cyclops from X-Men, and while his performance wasn’t terrible, it definitely wasn’t very memorable. This looks like it could be a semi-breakthrough role for him. It looks like it might be a split narrative of sorts, and looks like there could be some unexpected twists and turns, so could be decent. Let’s face it, De Niro hasn’t had a memorable role in a long, long time. And that’s a tragedy because he’s one of my all-time favorite actors. This smaller, more intimate role looks like it could be his best turn in years, and he genuinely looks funny in it, and not in that forced way he’s been sucked into. Directed by Martin Scorsese. Well that’s enough to get me to watch it. The cinematography looks brilliant and Garfield and Driver look like they might give their best performances to date. I’ve always thought Garfield was a great actor, and he’s got two upcoming, potentially great roles with this and Hacksaw Ridge. I feel the need to point out that this film will have Qui-gon Jin, Kylo Ren, and Spiderman all in it. So there’s that. So I’ve only seen a few minutes of this but outside of Moonlight, I can pretty much guarantee Fences will be cleaning up at the Oscars. Viola Davis is absolutely fantastic and Denzel, is well…he’s Denzel, and could potentially take home both wins as Director and Actor. This one looks intense. Finally. They gave us a clear look at the new King Kong and he’s absolutely massive, as promised. I love the setting, I love the 70’s Vietnam era, I love the casting (John C. Reilly and Samuel L!? ), and I absolutely love what I’m seeing from the cinematography. There’s a lot to love about this one; here’s to hoping it can deliver. More historical dramas this week. The story itself sounds incredible, and it looks decent enough, but I’m not entirely sold on this one. I like Chastain as an actor, but is it me or does her accent sound all the way off? 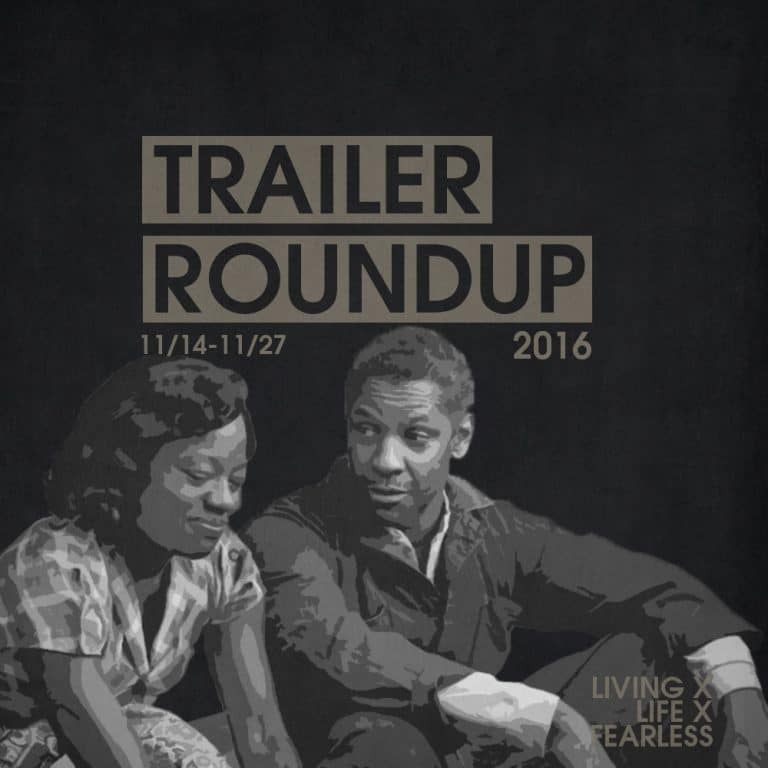 What’d you guys think about this weeks roundup of trailers? Which film are you most excited about? Which one do you think has the most Oscar potential? Let me know in the comments below and subscribe to stay up on all the content and gain access to exclusives.